Congratulations! You are a podcaster! You have spent countless hours thinking about your podcast, finding the right microphone, and you have a solid recording that you just finished editing. You're ready to record your second episode … right? Well, let's sit down and have a long talk about the most important part of your podcast …Your Podcast Show Notes. 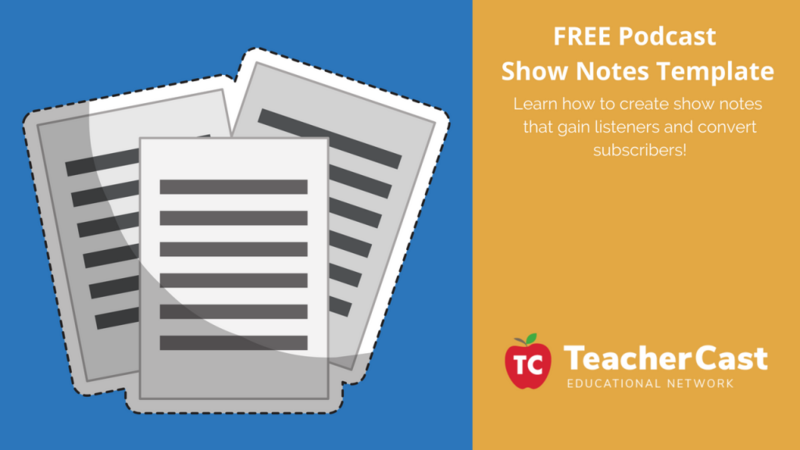 While you are here don't forget to join the TeacherCast Insiders Program to receive your FREE Podcast Show Notes Template Downloadable Google Doc! Why should you have show notes? It's a great question. There are so many reasons for doing great show notes and so many reasons for not spending any time on it. 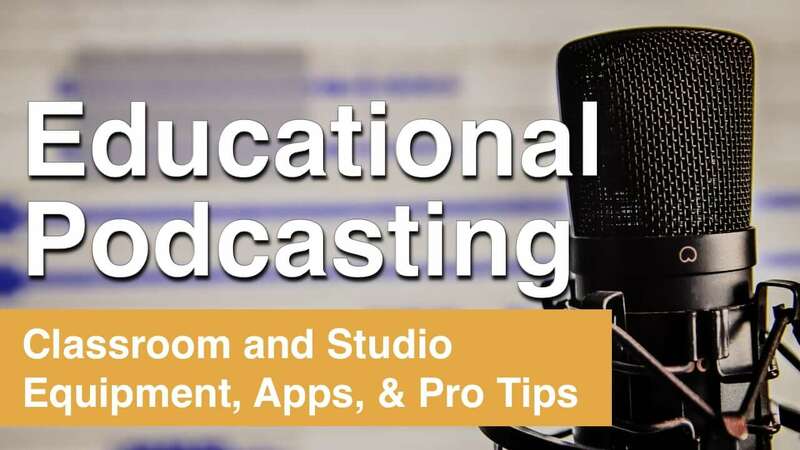 If you take a look at any one of the more than 500,000 podcasts in the Apple Podcast Directory, you will see that there are more than 500,000 different ways of creating your show notes. Let's take a look at some of the reasons why you should write quality show notes for all of your podcasts. At the very minimum, your show notes should act as a summary of what happened in your podcast. For some, this is a few sentences and for others, it's a full paragraph or two. Either way, the top of your show notes should include the name of the show, episode number, and your guests. Also included should be something that your guest is currently working on. There is a good chance that your listener will only be skimming the top of your post and so, for this reason, you should make things stand out as clearly as possible to entice people to click the play button on your post. All of the links that are outbound from your website should click to be opened in a new tab. 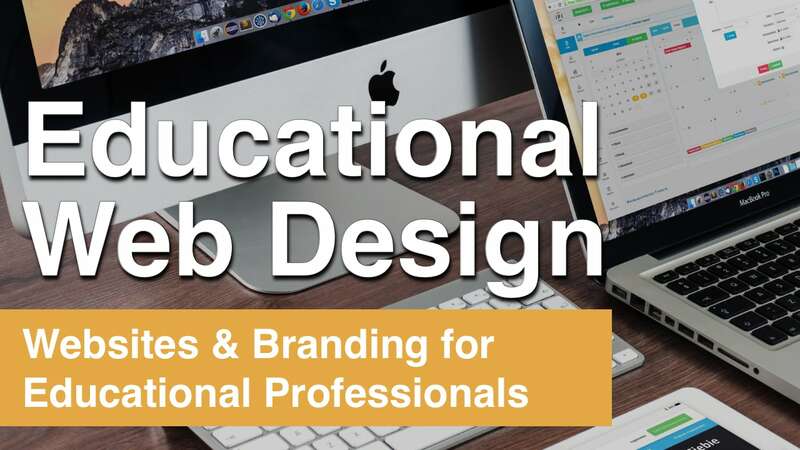 That if of course Web Design 101. However, the second goal of your intro is to provide the listener something to be active with. Your show notes are there to provide value in your content and so … link away! One of the things that you can use your show notes for is to build relationships with others. Perhaps you are working on a topic that someone else is an expert in. You can use your show notes to share not only your knowledge but promote others. Your Biggest Audience Member Still Is … and will ALWAYS Be…..
Let's say it together … GOOGLE! Your favorite search index is the single most important audience member you have. I'm not taking anything away from the concept of word-of-mouth marketing, but the bottom line is that everyone is doing a search for “how to create podcast show notes” and the hope for this podcaster is that Google pushes the very post you are reading up to the top of the search rankings. Because you must think about your human audience and your digital audience, you should be thinking about the way that both will find you. For example, every single TeacherCast Podcast comes to you complete with three distinct podcast titles. As we continuously think about Google and SEO, we should also be asking our current subscribers what they want from us. When was the last time you asked your audience (through newsletters or at a conference) what THEY look for in show notes? Are they getting to the bottom of your notes or are you just wasting your time the further down the page you go? If you take a look at the FREE Downloadable Template (don't forget to sign up below!) you will see that our show notes here on TeacherCast have both paragraph and bullet point topics. For those who wish to read, I start with a brief narrative. For anyone who wants to skim through the topics, I also have bullets. The nice thing about including topics in list form is that you can then add additional links to your show notes providing additional value to your post. Sometimes Less is … Less??? There are many reasons to create a podcast or write a blog post. 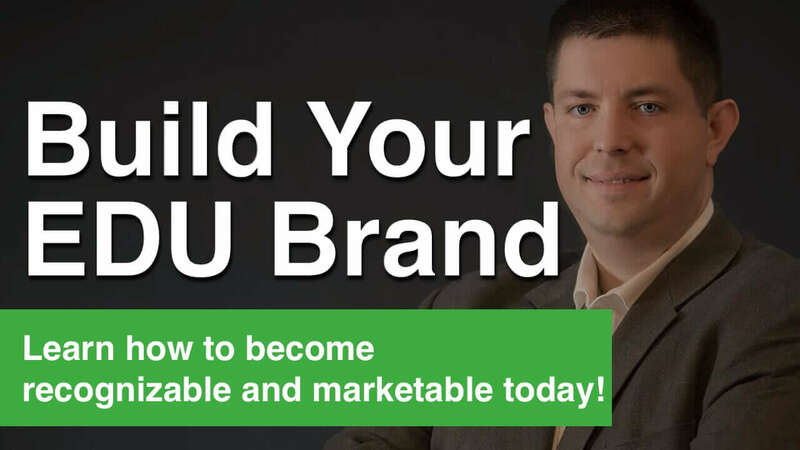 According to Amy Porterfield, there is really one definitive reason to create content and that is to hook your readers into signing up for your newsletter. Perhaps you are creating a show all about how users should be using Twitter to attract an audience. It is important at this point that your show notes support your twitter feed and are created in a way to entice visitors to sign up for your Twitter feed. The same goes for your Facebook Group/Community. Every piece of content should revolve around some type of call to action to grow your analytics. Free Giveaways are one of the best ways to create long-lasting value to your posts. 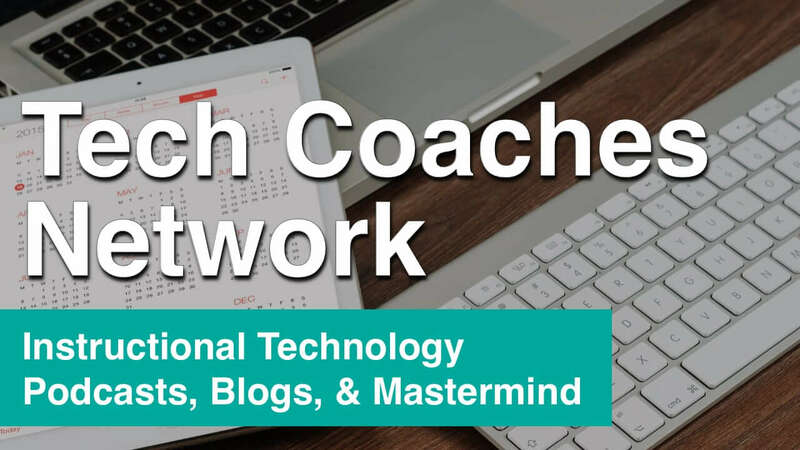 Did you know that by reading this post you can join the TeacherCast Insiders Program and get your Free Download??? Your podcast show notes are not just a window into your podcast but should be looked at as a starting point for your entire brand. Your show notes can say so much about you and your brand. When you take a look at show notes for several podcasts, you will start to notice how many brands relay solely on text and on which brands relay on beautiful infographics to entice users to learn more. Remember … infographics are nice but …. use them wisely. One constant part of your show notes should be your contact information or at the very least, a link to your contact page. If you have one shot to bring in a potential listener, subscriber, or business client … don't lose the opportunity to work together by not giving them the easiest way to contact you directly. Lastly, I can't recommend enough for you to come up with a template for your show notes. TeacherCast has a series of Google Docs for each of our shows that serve as templates for each branded show. By doing this, I have been able to save a tremendous amount of time and ultimately, it has made me a much happier host. It's also important to share your show notes with your guests while working on with them before the show so they know where their information is when you ask for it. To go with the above point, if your show notes are organized before the show, your job (and maybe the job of your cohosts or guests) is to contribute to your show notes DURING the recording process. This doesn't have to mean that you are creating perfect show notes while trying to have a meaningful conversation, but I always have my show notes doc open during the conversation for two reasons. What Do Your Podcast Show Notes Look Like? We would love to have you share a link to your podcast website and let us know what your podcast show notes look like and why you created them in the style you did. Please drop a link in the comments section below. Thanks for visiting TeacherCast Today!